Captain America #25 Review! Who is the New Cap? This issue is a landmark one, in that a new player dons the stars and stripes, and takes up the shield. It has been hinted at throughout the Captain America line for months now, and finally the issue is upon us. After this, a new volume of Cap will start at number 1, yet again, and we will all see how long Falcon retains the mantle. Is it a jackal? A jackal! Jackal! Is it a jackal? First of all, the cover is ridiculous. 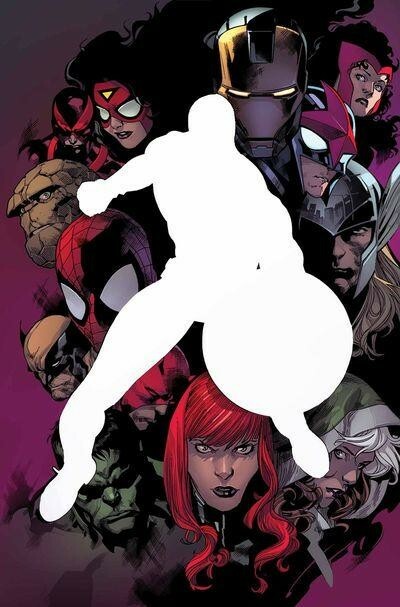 I understand the image, in maybe a teaser capacity in the weeks leading up to this issue, but to have it as the actual cover is so not needed. It has been in the press for months now that Falcon, Sam Wilson, will be taking over as Captain America because of the recent events that has left Steve Rogers without his super soldier serum. Steve is now an old man, who can’t much fight or wield his mighty shield anymore, so it makes sense to have someone else step up. But, I really believe that the talent at Marvel could have come up with a better cover, and not just a variant one. This is addressed tongue in cheek within the issue though, with the big reveal not being so big or reveal-y. The issue on a whole holds up, with a great little send up of Sam Wilson and the strength of his character as he plummets back to earth from saving everyone from a bomb. (See last issue.) Sam is just a man, fighting alongside gods and superpowered beings, yet he always stands up for what he believes is right and true. He is one of the rare examples of humanity in comics, and one that always seems to be infallible. Once he awakens from being knocked out, the heroes rejoice, as well as Jet, Zola’s daughter and new lover of Sam. But that is all short lived, because no one ever stops to explain themselves in comic books. Zola wishes her to return with him, fearing what the Red Skull has planned (in the upcoming AXIS event), and Jet initially refuses. But a newly returned Sharon Carter explains that Jet must be a spy for Zola, with damning evidence, and Iron Man proceeds to make things immediately worse, resulting in Jet returning to Dimension Z with Zola. That will not be the last of them by a long shot. The rest of the book is a fun little jab-fest, where Steve gathers all active, and inactive Avengers (with Wolverine missing: is he already dead?) to usher in Sam as the new Captain America. Jokes aside, it is interesting to see so many heroes all gathered in one place, and at the Avengers Mansion. Normally, things like this go very badly, such as in Avengers Disassembled, but this time it seems to all work out. Until the epilogue of the book, which I won’t reveal here, but well most definitely be the set up for the governing story arc of the new Captain America series. Captain America, now with Wings! No, not Paul McCartney…. The send up of Sam Wilson, and who he is and what he means to the Marvel Universe, is touching and on point. He is a character that is left in the dust by flashier characters all the time, and it will be interesting to see how he handles the mantle of Captain America. 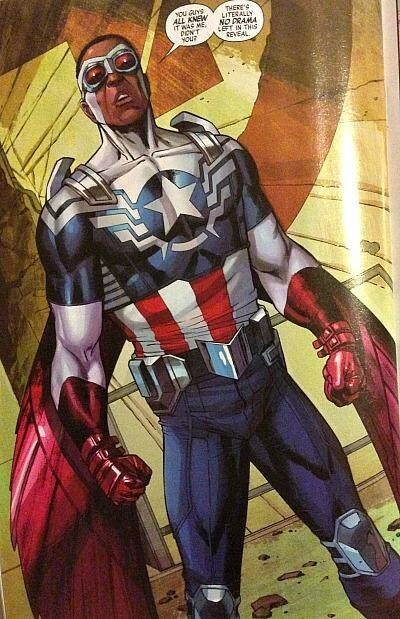 Also, he seems to retain the wings as part of the stars and stripes as well, which is an interesting development. Rick Remender is a great writer, and I can only hope the events he alludes to in the epilogue will pay off in great dividends in the next few story arcs. I am going to say it again, the cover was lazy. Also, some of the jokes made by the Avengers during their big meeting, I know were to show levity in the situation, were really trite. Many characters only got face time, and seemed to not be needed there at all. Like, Black Panther was there, and has a long history with both Steve and Sam, yet was featured in the side of a panel, and no lines were uttered. Waste of a good character, in my mind. CBH Score: 3.5 out of 5. Suffice to say, I am very interested to see where Falcon will take this series, and I am sure Steve, and Sharon, will still play a major part in it, just in a Charlie from Charlie’s Angels sort of way.